You may have heard that pets are beneficial to mental health, and we are here to dive into that idea head-on at our Pet Therapy event! Come join us and a pack of PADS therapy dogs in the atrium to experience pet therapy hands-on, while learning all about the benefit of pet therapy and getting a chance to ask all of your questions. Our peer navigator, MJ Moore will be giving a presentation on the benefit of pet therapy in peer support, which she is also presenting at the National Conference on Peer Support. 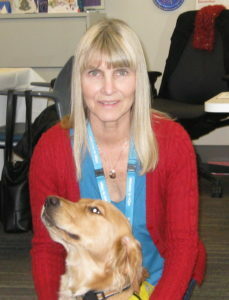 MJ is a certified peer supporter, who also volunteers training PADS dogs like Juniper, who has become a familiar face at the Kelty Dennehy Mental Health Resource Centre. MJ’s work was recently featured by CMHA National as a part of CMHA’s 100th Anniversary. Come pet dogs with us! Your mental health will benefit, and you might even learn a thing or two.